Christie, for the third year running, played a key role at the Fiesta de la Luz in Quito (Ecuador), Latin America’s biggest light festival. Fifteen Christie Roadster WU20K-J projectors were the driving force behind three mapping projections on the facades of the city’s cathedral and the churches of Santo Domingo and San Francisco. 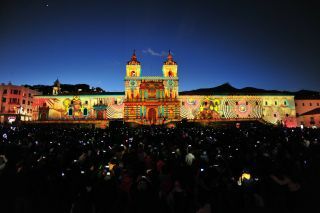 Organised by the Quito City Council, this is the third year of the light festival whose mission is to artistically light up the city’s main historic buildings. This year coincided with the 40th anniversary of the declaration of Quito as a UNESCO World Heritage Site and the event attracted 2.5 million people who strolled through the streets of the old quarters of the city over the course of five nights. The Ecuadorian rental and staging company 3Laser was commissioned with organizing the festival’s mapping projections thanks to its reputation as the country’s leading name for the production of large-scale projections. Ángel Cuesta, director of 3Laser, explained some of the peculiarities of Quito when it comes to staging open-air projections: “Unlike other cities in Ecuador where we have done mappings before, the altitude of Quito, at a height of 2,800 meters above sea level, coupled with the high contamination, creates very specific conditions. “We carried out tests using projectors from other brands with 18,000 lumens and WUXGA resolution, and the lamps only lasted half the length because they didn’t have the proper filters required; all they had were optical filters. That means that the pollution goes straight to the lamp bulb which produces a kind of black veil over the glass, and deposits dust on the reflector,” said Questa. The projections during the Fiesta de la Luz were a resounding success and were highly acclaimed by both public and press alike. “There is no margin of any kind of post-production in live events. They either work or they don’t, there is no middle ground. And, in this case, once again, the Christie projectors performed extraordinarily well and enabled us to exceed our client’s expectations,” concluded Cuesta.